Home » dating after divorce » Guest post: Why Stunning Photography is Important! Guest post: Why Stunning Photography is Important! Today’s post is authored by Blake Robinson, a photographer in Fairfield County, Connecticut whose profile photos are unique and definitely stand out from the usual run-of-the-mill professional photos. I highly recommend him. I asked him to let my readers know what makes for a great online dating photo shoot and why stunning photography is so important. 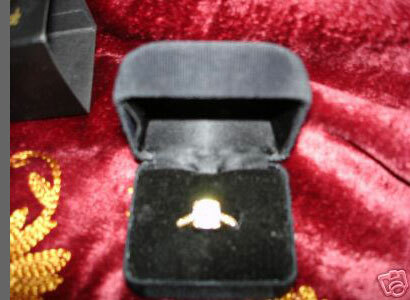 This picture, posted on EBay, is trying to sell a ring. Would you buy it? I don’t think so! Aside from the image being totally out of focus, it’s poorly composed and harshly lit. Worst of all, it doesn’t give you a warm feeling for the seller. This is just not someone whom you’d want to trust with your money. And so it is with photography for dating sites. A weak photograph is going to cause the man (or the woman) to keep looking. But great photographs can dramatically increase your chance of attracting a good match. Here are some tips on how to choose a professional photographer. Make the shoot a relaxing, comfortable and fun process for you! This will lead to natural-looking and eye-catching pictures. Present you in attractive and engaging poses that are appropriate for the image you are trying to project. In Photoshop editing, make you look as fabulous as possible, but still look like you. Overly retouched images are obvious. Good editing is invisible. Show something unique about your personality. Bring in a professional makeup artist if desired. 1) We talk on the phone about what you’re looking for: pose ideas, wardrobe, etc. 2) In the studio we’ll shoot 3 or 4 looks – headshots, dressy and casual. I take a lot of images – perhaps 200 or so over an hour and a half or two hours. 3) At the end of the shoot, we’ll go over the images together and choose the best 12 to 15. These will be fully edited and retouched in Photoshop. A DVD of these images is produced and you may use them for dating sites – or any other purpose (your website, Facebook and LinkedIn head shots, resume, etc.). These shoots are terrific fun for me. I’d love to work with you! With Sandy’s support, encouragement and advice, along with some great pictures, you’ll be ready for your Last First Date indeed! Blake Robinson is a Darien-based photographer with a studio in Norwalk.